Rust is the name given to the compound iron oxide. It is a red-brown coating that forms on iron or steel as a result of contact with oxygen and moisture. Iron oxide, the chemical Fe2O3, is very common since iron combines easily with oxygen. The electrochemical process of rusting is a type of corrosion, involving a metal that readily gives up electrons (also known as an anode), a liquid that helps the movement of electrons (also known as an electrolyte), and a metal that readily accepts electrons (also known as a cathode). When metal corrodes, oxygen is provided to the anode by the electrolyte. This is because the water combines with carbon dioxide in the air to form a weak carbonic acid which is a good electrolyte. As this acid is formed and the iron dissolved, the components of water – hydrogen and oxygen – are produced. When the oxygen combines with the metal to form iron oxide, the electrons are freed to be able to move, allowing them to flow through the electrolyte to the cathode. Rust can be aesthetically unappealing and can result in serious structural damage or even building failure. Since rust is permeable to air and water, the interior metallic iron beneath a rust layer will continue to corrode. This means that to effectively prevent rust, coatings must preclude the formation of rust in the first place. A corrosion-resistant alloy is an alloy that consists of metals such as chrome, stainless steel, cobalt, nickel or titanium. 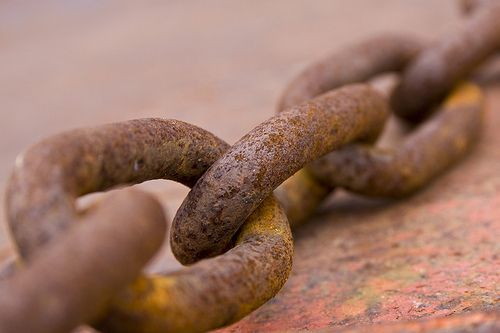 In combination, these metals can provide reliable protection from corrosion. An example of this is weathering steel, also known as COR-TEN which is chemically composed to form a stable rust-like appearance that can resist corrosion and abrasion by forming a protective surface layer or patina. For more information, see Weathering steel. This involves a layer of protective metallic zinc applied, either by hot-dip galvanising or electroplating. Zinc is most commonly used as it is relatively inexpensive and adheres well to steel, although in more corrosive locations (such as coastal environments), cadmium plating may be preferable. Galvanisation can fail where there are gaps in the coating, such as at seams, holes and joints. Although partial cathodic protection to the iron is provided, it lasts for a shorter period of time. This is used to prevent corrosion on buried or immersed structures. It supplies an electrical charge that suppresses the electrochemical reaction. A sacrificial anode is attached, made from a material such as zinc, aluminium or magnesium, which has a greater negative electrode potential than the iron or steel to be protected. This anode should be replaced over time as it eventually corrodes away. The formation of rust can be controlled by using certain coatings that isolate the metal from the environment. This can include paint, lacquer or varnish. Steel can also be covered with concrete which offers some protection because of to the alkaline pH interface of the steel and concrete.